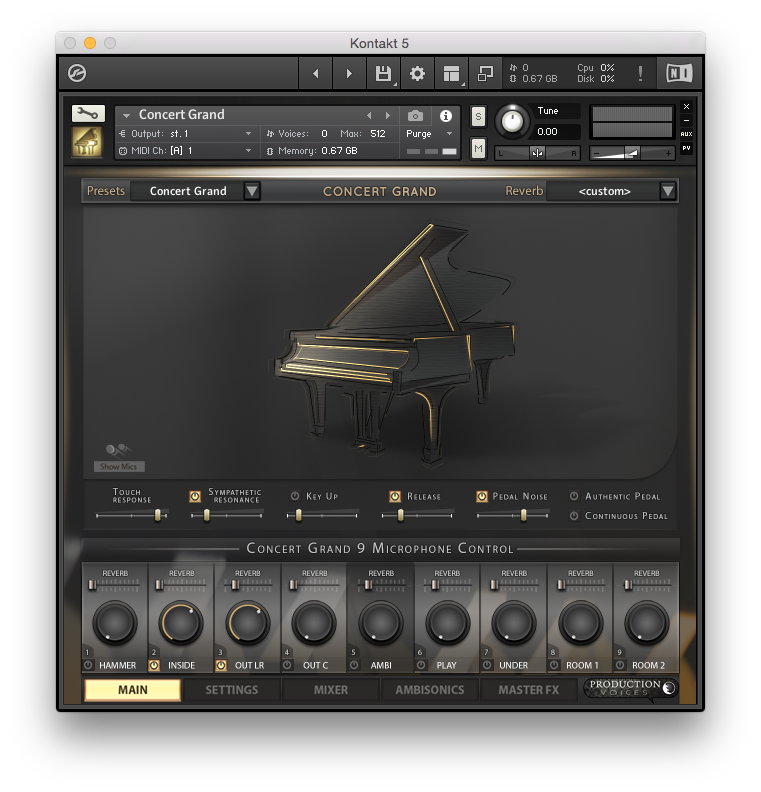 Concert Grand is a premium 1100 GB*, 9 microphone piano sample library sampled from a Steinway D New York 9′ Concert Grand Piano built for the full version of Kontakt 5.8 and above (not for Kontakt Player). *1100 GB before lossless compression; product delivery size ranges from 77 GB to 576 GB. If you listen to iconic classical or jazz piano recordings, chances are that was a Steinway D, the iconic king of the concert stage. For decades, performers have requested the warmth and grandeur of the Steinway sound. It is in heavy contrast to bright pop production pianos found in many recording studios. It’s elegant and refined. Every engineer has a slightly different way of recording such a large instrument and every player wants to hear a different aspect of the sound. This is why Concert Grand’s 9 microphone control is so important. You can dial in a variety of tones with microphone placements that are time-tested by audio engineers. 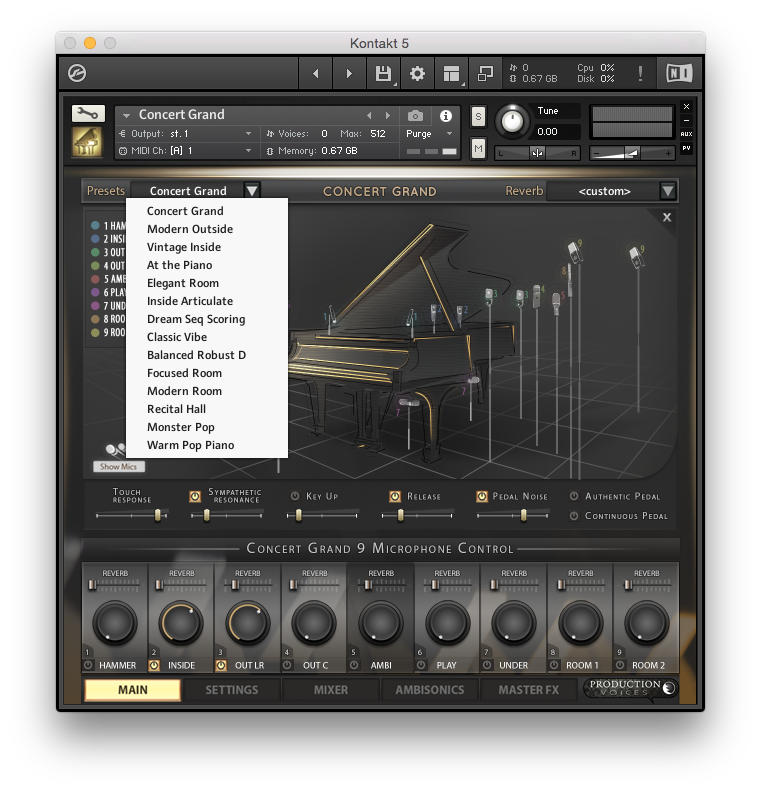 Concert Grand let’s you take control of your sound unlike any piano library before it. The ambisonics channel is a leap forward in sample library flexibility. Be warned! Concert Grand captures all this Steinway has to offer including its thumps and bumps and louder than most mechanical noises. We didn’t strip away the imperfections, but let them contribute to the authentic piano sound. Concert Grand includes Concert Grand LE, Concert Grand Gold and the high definition Concert Grand Platinum 24 bit 96k samples for a complete virtual library experience of premium sample quality to fast-loading 16 bit 44.1k samples well suited for live performance, scoring, album production, practice and more. Contact support for hard drive shipping options, if the downloading is a concern. The ambisonics channel provides complete 3D sound of the piano allowing users to rotate the sound direction from any spherical direction 360 degrees up, down, left or right. The virtual microphone can be pointed at the piano or the room or anywhere in-between. The ambisonics channel was recorded using a Soundfield microphone. Ambisonics is the most flexible audio format allowing for a single mic through to 5.1 surround sound and beyond! The ambisonics output can be mapped to your digital audio workstation for external ambisonic processing in plugins such as Harpex and SurroundZone2. Film and game composers as well as sound designers will appreciate the ability to put piano sounds into virtual reality worlds in full ambisonics or surround sound with very little effort compared to traditional sample libraries. Microphone selection and placement makes all the difference to a quality recording. Audio engineers the world over have relied on the sound quality and tone of standards such as U87 and 4006 microphones. B&K (now DPA) 4006 microphones are used on classical recordings for their true-to-life linear sound. The signal path for the sampling of Concert Grand represents the best of the best from microphones to preamps and to converters. It’s a bold claim, but rings true in the sound of Concert Grand. 96k gives clean crisp audio that contributes to the high definition sound quality when several microphones and several notes of polyphony are used. 9 Microphone perspectives are impressive on their own, but how Concert Grand handles these sonic choices puts you in the engineer’s seat when you are not on the piano bench. The mixer is a full complement SSL emulation with SSL simulated EQ and compression on every channel. Get the same control as if the piano were recorded on different tracks in a recording studio. 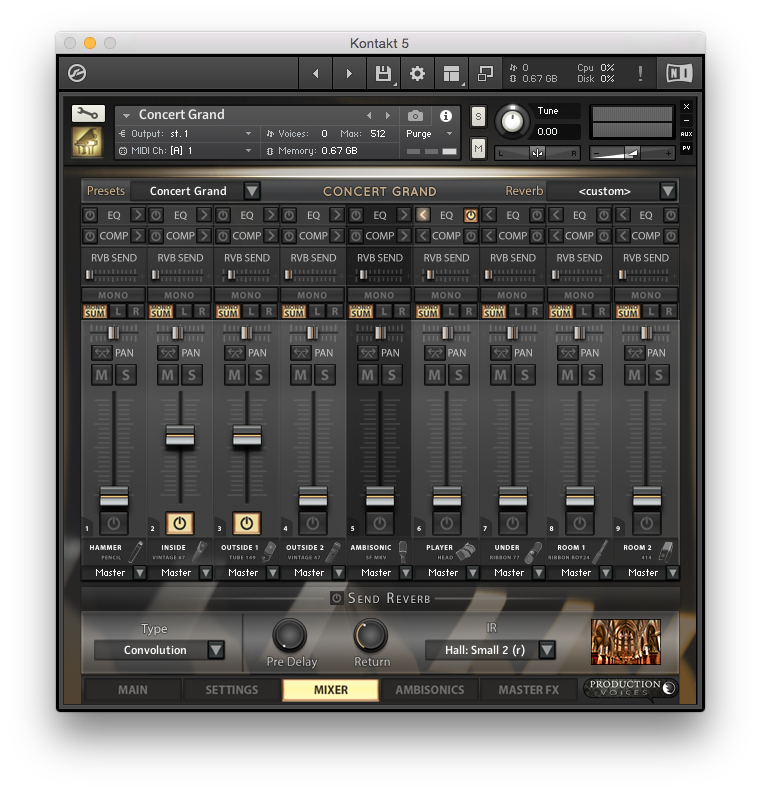 Album quality production is the goal with Concert Grand’s mixer section. Concert Grand is sampled from a 9′ New York Steinway Model D built after 2010. The difference between a new Model D and an older Model D can be heard in the action, hammers and overall tone. Without a doubt this is a majestic piano with all the signature sounds that you would expect from this model. The tone is not overly sharp or piercing as on some Japanese models, but it still speaks well. The piano is naturally mechanically noisy, which makes for an authentic piano sound. We didn’t mask the imperfections. You get a concert grand at your fingertips with all the controls that an audio engineer would have to create finished recordings right from the software! 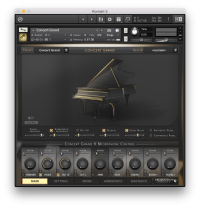 Concert Grand has some amazing presets to get you started playing and enjoying the library right off the get go! These presets were crafted to sound great in a variety of styles and make use of the 9 microphone choices. 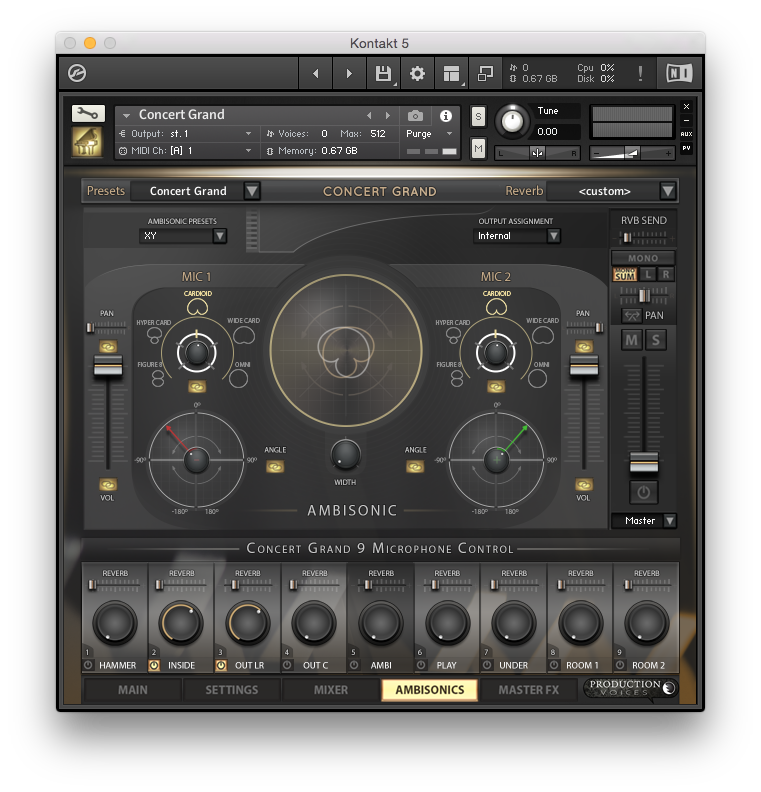 The Ambisonic Section also contains presets that cover a variety of virtual microphone positions. The sound pallet possible just from the ambisonics alone would make Concert Grand worth the purchase price! There are traditional stereo microphone perspectives such as XY and Blumlein as well as creative microphone placements that add depth to the room sound. 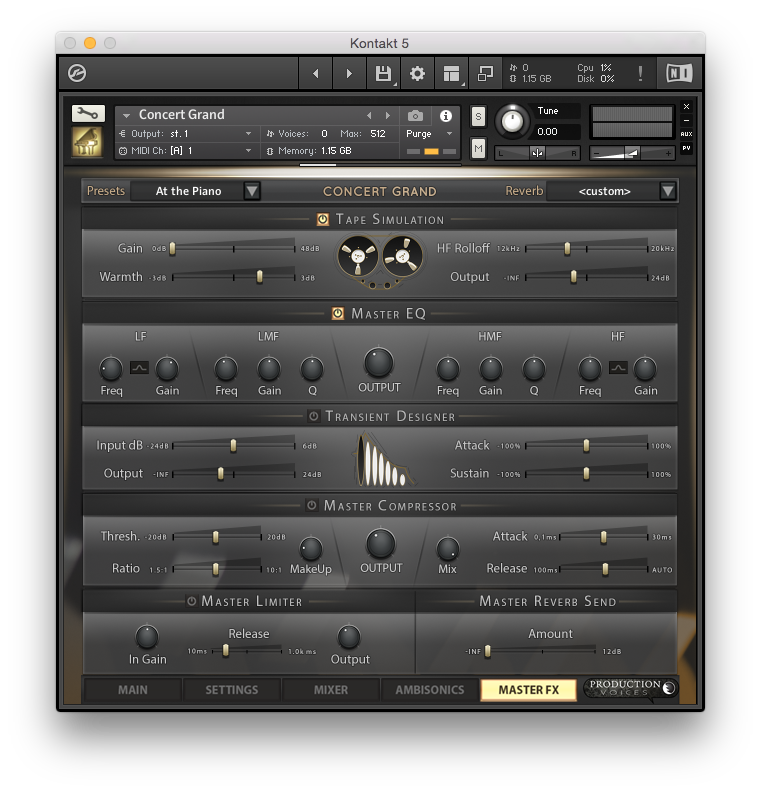 There is plenty to explore in the ambisonics inside of Kontakt, but much more to explore when the ambisonics section is used in a DAW such as Pro Tools or Logic. The reverb section contains 29 impulse responses all set with the right amount of pre-delay on each. There are plates, halls and studio reverbs to enhance the piano performance experience. Every mic perspective also has its own reverb send so the sound can be shaped based on what mics you are using. Many of the instrument presets make use of the built-in reverb.